The All-Party Parliamentary Group (APPG) on General Aviation has expressed its “deep and growing alarm” over Ministry of Defence plans to dispose of 15 military aerodromes in a letter to the Secretary of State for Defence. 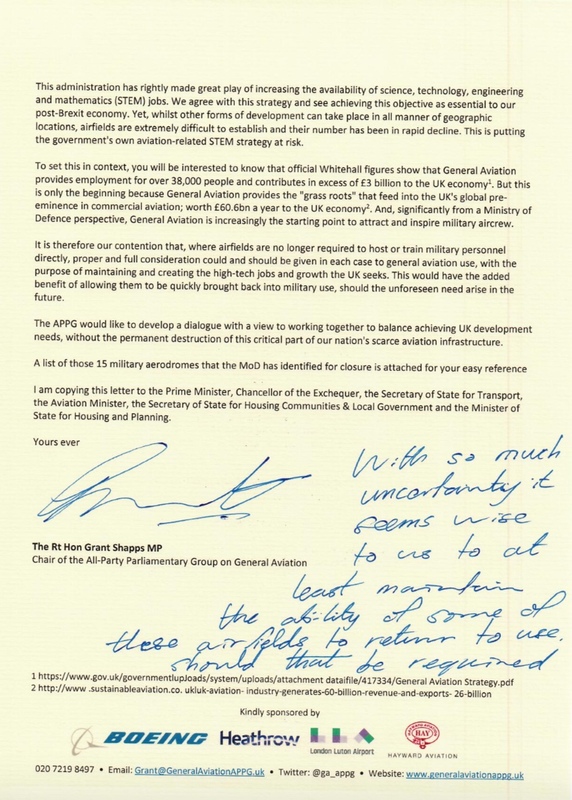 In a comprehensive letter to The Rt Hon Gavin Williamson MP, the 148-strong parliamentary group on General Aviation urge the Government to give full and proper consideration to retainining aerodromes for general aviation use; allowing them to be brought back into military service should the future need arise. The letter from MPs and Peers argues that the UK needs to continue building the science, technology, engineering and maths (STEM) skill base that aviation excels in providing; and cautions against removing another 15 airfields from aviation forever. Nearly all the UK’s stock of airfields was built during the wars, and the parliamentarians point out that planning laws mean that it is virtually impossible to build even a single additional runway in Britain today. The prospect of permanently shutting more than a dozen aerodromes therefore makes no sense. The letter also cites recent operations in Syria and the current global uncertainty saying that it is “difficult to accurately predict future defence needs”. The all-party group argues that at least some of the under threat military aerodromes should be retained in aviation use to support jobs, the economy and as a standby for the military in future. Grant Shapps MP, Chair of the 148-strong all-party group, said: “At a time when the UK and our allies are facing significant global threats and uncertainties, the all-party group on General Aviation is deeply concerned to see the Ministry of Defence disposing of military aerodromes across the country. Airfields are national assets which are virtually impossible to replace. The All-Party Parliamentary Group on General Aviation has 148 parliamentary members from across both Houses of Parliament, and all the major political parties. The full membership can be found at www.GeneralAviationAPPG.uk/parliamentary-members. 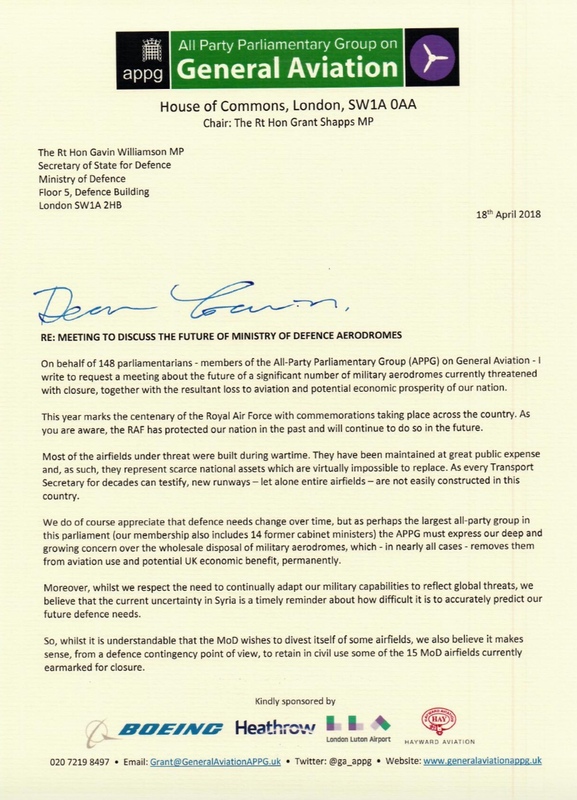 The full letter to the Defence Secretary can be read below. The list of military aerodromes earmarked for disposal has been provided by the General Aviation Awareness Council (GAAC). General aviation is worth 3bn to the UK economy and is the conduit to the broader 60.6bn aviation sector. The UK now has just 123 licensed airfields with less than 100 being available for pilot, air traffic control and other training. Those airfields that are closed are never replaced, so our stock of airfields as a nation is rapidly deminishing. The APPG on GA believes that airfields should therfore be treated as a scarce national asset without which our aviation and – in this case – military interests will be damaged in the future. The APPG on GA operates four Working Groups on Airfields, Airspace, Tax & Regulations and Heritage. A further two Working Groups on STEM Jobs & Skills and Engineering and Manufacturing will shortly be established. The full range of APPG work can be found under Working Groups at www.GeneralAviationAPPG.uk.